If you're going to be in Orlando any time during the 2018 holidays, you'll find a variety of events to mark this celebratory season. There's the official tree-lighting ceremony, favorite holiday music shows, a tour of houses decorated for the season, and special events at Walt Disney World, Epcot, and Universal. Don't miss out on the festivities. Lake Eola Park will be the scene of the City of Orlando's yearly tree-lighting ceremony. It will take place starting at 5 p.m. on November 30, 2018 with live performances and the lighting of the 72-foot-tall evergreen tree at 7 p.m. And forget about having dinner at home. Nosh on offerings from food booths and The Daily City’s Food Truck Bazaar while you watch this once-a-year show. The event is free and includes live music and entertainment. Holiday music is a central part of the Christmas season, and Orlando has plenty to offer in 2018. The Brian Setzer Orchestra and its "Christmas Rocks" show, an 18-piece swing and jump blues band, comes to Orlando's Hard Rock Live on December 7 at 8 p.m. Tickets range from $86 to $253 apiece. The Trans-Siberian Orchestra brings its show "The Ghosts of Christmas Eve" to the Amway Center on December 15, with two shows at 3 p.m. and 8 p.m. Tickets start at $68. And the Orlando Ballet performs the beloved Christmas classic "The Nutcracker" at Walt Disney Theater at the Dr. Phillips Center for the Performing Arts from December 8 through 15, 2018. Tickets start at $19 per person. Celebration, Florida, about 20 miles from Orlando, is the scene of an annual holiday home tour of decorated estates, single-family houses, and condos. On this self-guided tour, you drive yourself to each house on the itinerary and will be greeted with tons of twinkling lights and festive decorations. Because the neighborhood is close to Disney World, many houses have Disney-themed decor. The Celebration Holiday Home Tour also allows access to the Artisan Clubhouse, which will feature a hot chocolate bar. The tours are held on December 1, 2018 from 3 p.m. to 9 p.m. and December 2 from 1 p.m. to 5 p.m. The tours take about two hours. Tickets are $20 apiece. What's Christmas without a visit to Santa, that jolly old elf? He'll be at the Mall at Millenia's Hollyville from November 3 through December 24, 2018 during regular mall hours. Avoid those long Santa lines at the mall by going on weekdays around dinner time. The closer it gets to Christmas, the longer the wait times, which could be as long as five hours on weekends close to the big day. You can buy photos or snap your own. If you choose to take your own photos (three maximum allowed), the mall encourages a $10 donation to the Arnold Palmer Hospital for Children. Note: Sunday mornings are the busiest, followed by Saturday mornings, when the wait time starts at two hours. Tickets are provided at no cost as a first come, first served basis. A limited number of standby tickets will be given out, however a visit with Santa is not guaranteed in these circumstances. From November 8 to December 21, 2018 on select nights, Walt Disney World's Magic Kingdom is hosting Mickey's Very Merry Christmas Party. 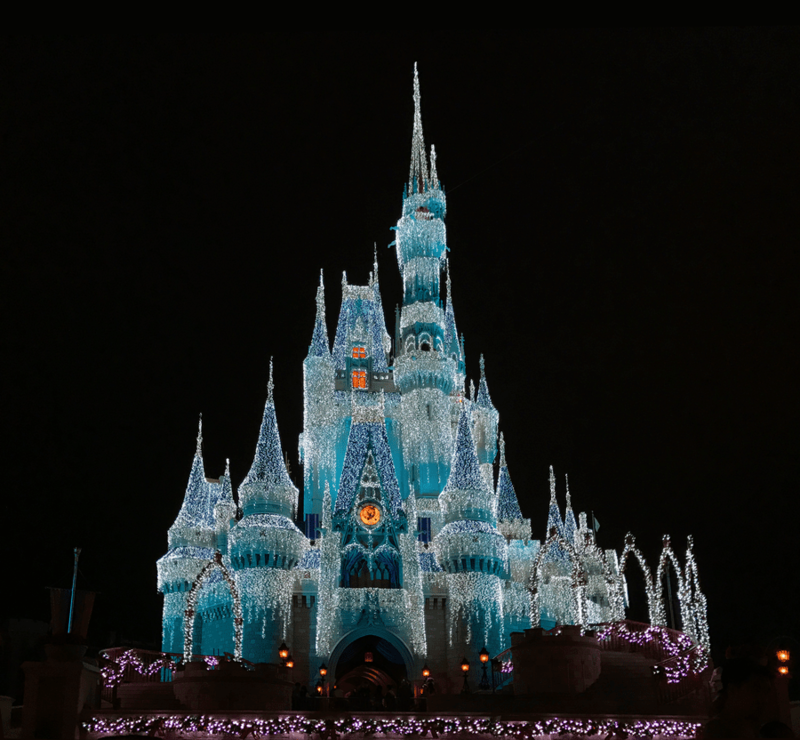 Cinderella's castle sparkles in thousands of lights, and there's magic snow on Main Street (the only place you'll see it in Florida). Plus, there is a Frozen-themed show and a Holiday Wishes dessert package. Magic Kingdom also hosts the Holiday Wishes Fireworks Dessert Party at Tomorrowland Terrace, which is additional fee from the regular park admission. If that's not enough, you'll also be treated to live entertainment, fireworks, and a parade as only Disney can do. Over at Epcot from November 18 through December 30, 2018, check out the International Festival of the Holidays (included in regular park admission), where you'll find 15 holiday kitchens serving seasonal treats from around the world. In addition to the sweets, there is a nightly Candlelight Processional, the IllumiNations: Reflections of Earth fireworks show, and live musical performances. Meanwhile, Hollywood Studios has its own set of activities between November 8, 2018 and January 6, 2019. The stars of ABC’s Prep & Landing will lead the Jingle Bell, Jingle BAM!, which features fireworks, music, and projections. Then, Sunset Boulevard will become a winter wonderland thanks to decorations by Sunset Seasons Greetings.